Sandcastle The Sandcastle is a 4-plex, that sits right on the sand. There are 2 units on the first floor, and 2 units on the second floor. Your unit #916A Unit #916A sits on the second floor on the south side of the building. This is a very simple property. You have a Queen bed in the bedroom area, and there is also an Aerobed (Queen size) that can be used in the living area. There is No Air conditioning in this property, but you can open the sliding glass door that goes to the balcony and have amazing ocean breezes. I would highly recommend this for 2 Adults, or family with 2 children. A little too small of a property for 4 adults. â€‹â€‹â€‹â€‹â€‹â€‹â€‹ The area Relax in a quaint beach town, stroll on the quiet beach. Walk on the old fishing pier, and bring your rod and bait! Excellent surfing! Watch or participate! 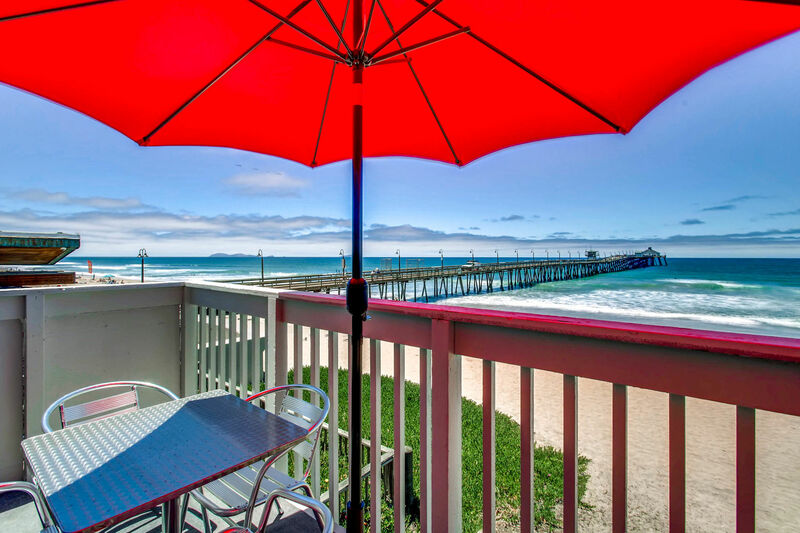 A 10 minute drive affords you easy access to the famous Island of Coronado and its golf course. 25 minutes takes you to the world famous San Diego Zoo, Seaworld, San Diego Embarcadero, San Diego Convention Center, fabulous desert or mountain drives, Mexico, and all that the sophisticated city of San Diego has to offer! 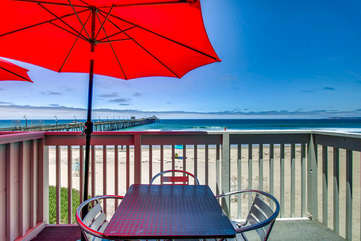 Right On The Beach-We just stayed here for the first time (I have been a regular guest at the Imperial Beach Club rentals) and enjoyed ourselves so much. It's a small cozy place but perfect for the two of us and our two well-behaved fur kids (they loved watching the ocean and people from the balcony as much as we did!) The unit has everything needed for a comfortable stay. It is located just steps away from the IB Pier and great dog-friendly restaurants along Seacoast. We'll be back! very clean, nice place-there was an issue when we first arrived and it was taken care of immediately to our satisfaction. The beach and the ocean are right at the house so it was nice to watch the waves and the people walking on the pier. We would stay there again if we ever got down to Imperial Beach again. Could not get closer to the beach!-We have stayed at the Sandcastle several times in the past. The owner has made some nice renovations. We walked on the beach each night and on the pier as well. Watching the surfers was entertainment. So close to restaurants. Sleeping with the sound of the waves is the best. Great stay!-We love staying at the Sandcastle locations. The location is fantastic and you don't need to search for somewhere to park (parking spots are hard to find anywhere in CA). The rooms are always welcoming and super clean. You can't beat the view from the 2nd story deck either! Peaceful-Very peaceful. Not sure if it would be the same during the high peak summer months. .-This is the second time that we have spent part of the winter with you. If at our age we are lucky enough to make the trip from Michigan again we would stay with you once more. Wonderful-Everything was wonderful. Our blinds were broken on the sliding glass door when we arrived and maintenance came and fixed them right away. Very quick attention to the problem. We really enjoyed our stay with you and will definitely be back again. Great place-I loved the location and view! Bed and linens were really wonderful. Friendly and easy info and check in! Happy with our stay!-We were referred from family members (Lyle & Terri Bell), and we couldn't have been happier with our stay! It was fantastic, and the unit was very clean and modern, and had all necessary amenities. Would definitely do it again! Family Friendly-Family friendly environment. Third year renting and the stay has always been quiet and relaxing. Husband and I enjoy staying here.